With spring in the air it was time to setup the garden fountain made from 350 recycled plastic milk bottles. It’s actually intended to be a flower pot by Kuldesigns but with a little ingennutity a fountain pump with a led spotlight was added along with a bucket of pebbles to cover the inside wiring and pump. 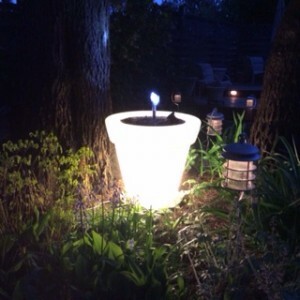 A light bulb tucked from the underside of the pot gives a beautiful glow in the garden for all to enjoy.